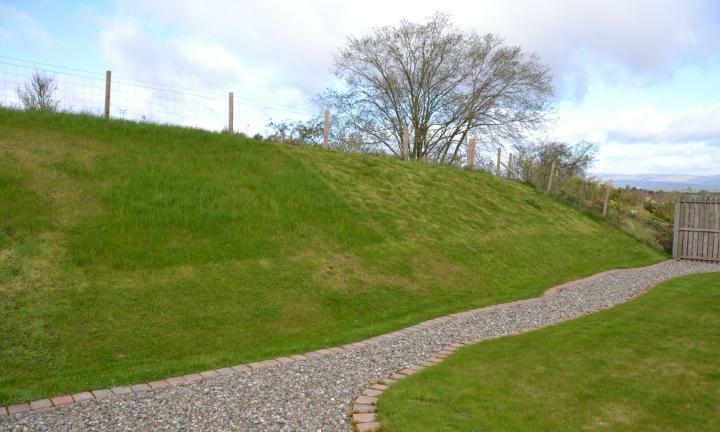 This stunning project took place in the large garden of a new build steading development in the small country town of Dunning. 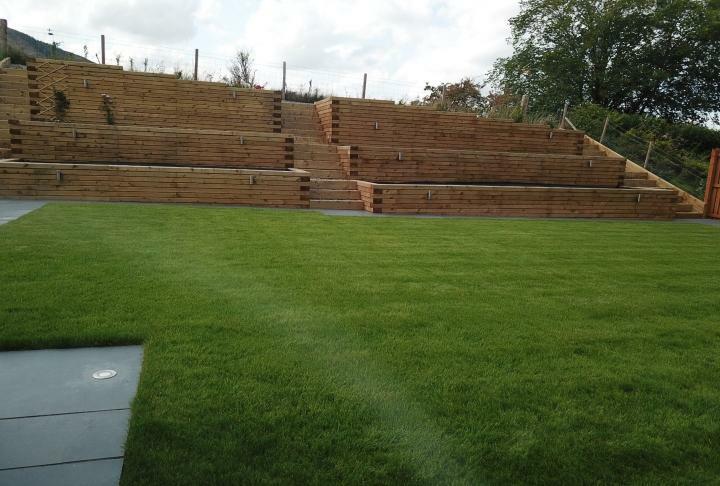 The garden was a good sized blank canvas with a steep banked area to the rear. The client wanted a garden with areas to grow plants, fruits and vegetables. 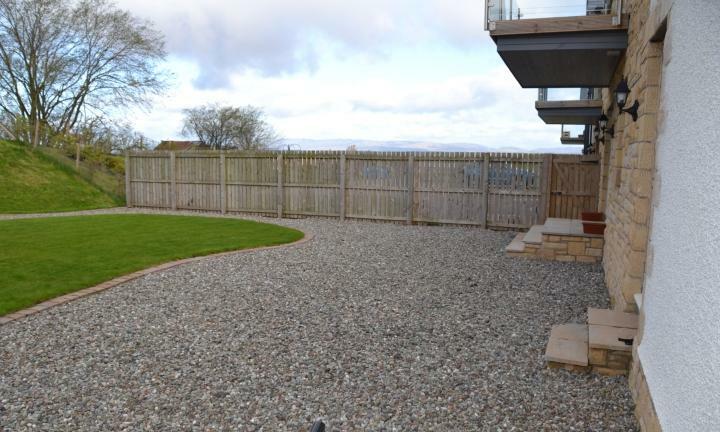 An attractive seating and entertaining space in keeping with the property was also a requirement. The client asked for a potting shed and garden lighting to be included within the design and as part of a project-managed package. A design drawing was produced to effectively use all of the available space and several different materials were considered for the paving and patio areas. 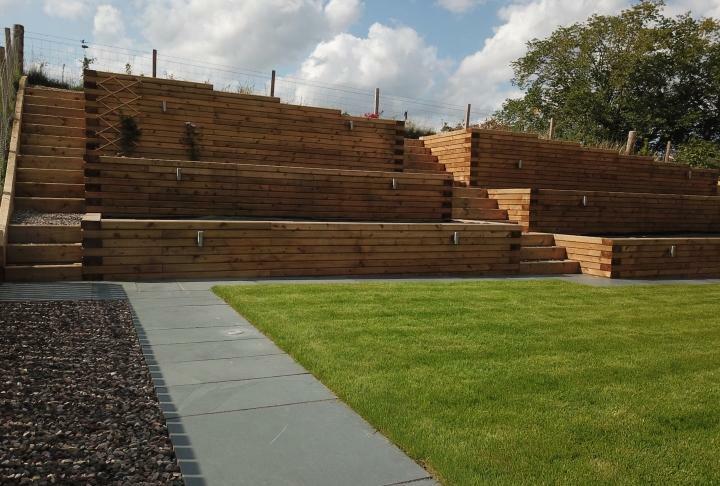 Walls constructed from wooden sleepers erected along banking to form terraced planters. Three matching sets of steps constructed for ease of access to the different levels. 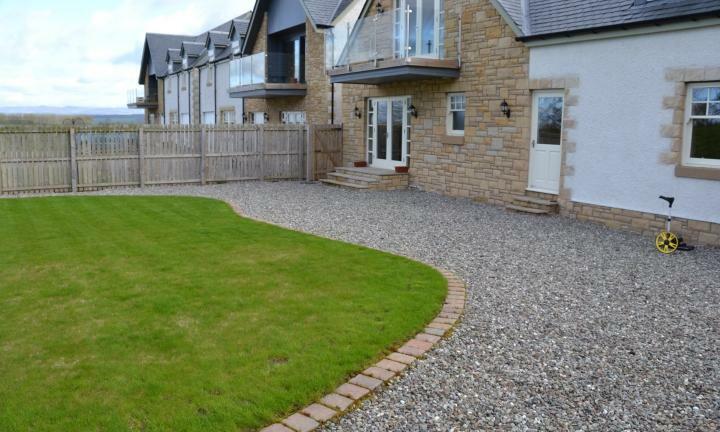 Smooth Casarta light grey slate chosen for paths and patio to complement the style of the property. 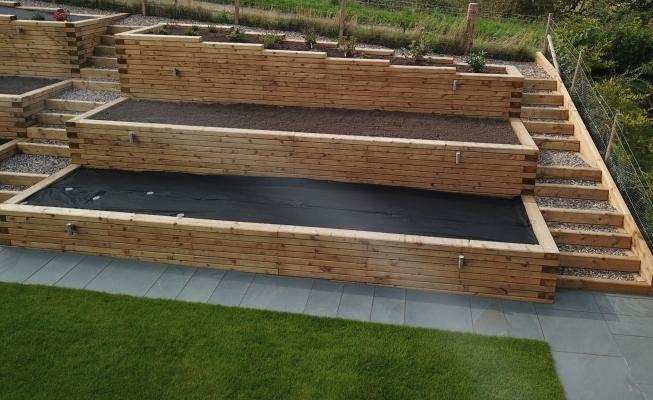 A smaller raised bed constructed from sleepers on side boundary. Fresh turf laid to form central lawn. 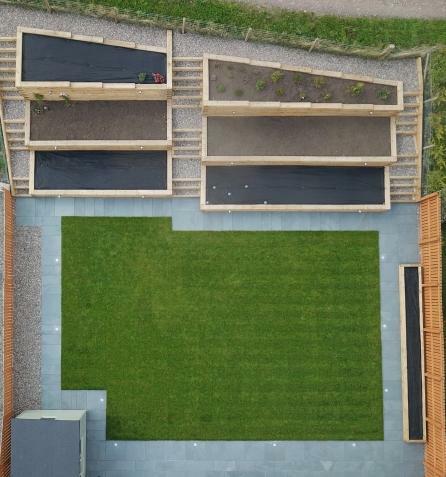 This blank canvas with rear banking was transformed into a garden with real impact and plenty of style. 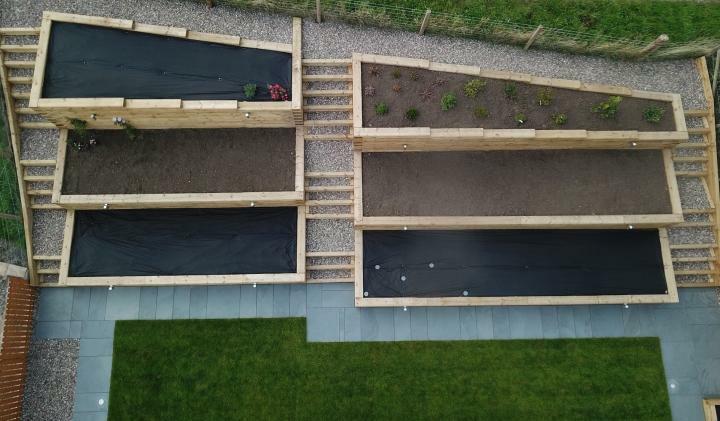 The vast terraced planters provide the perfect space in which to grow a variety of plants and produce. 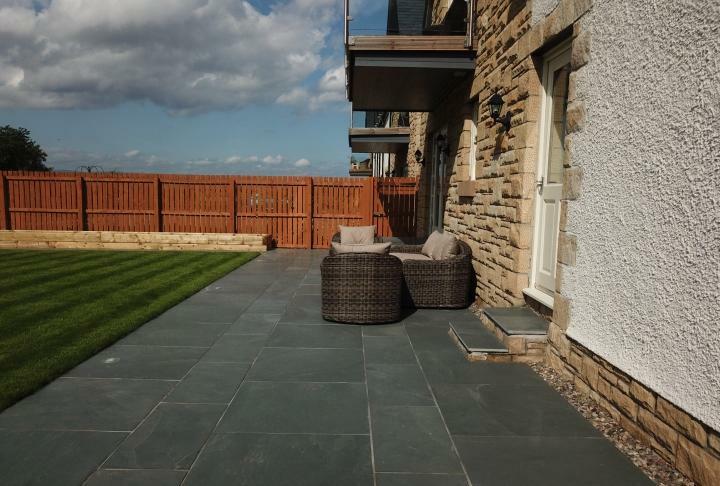 Modern Casarta slate in light grey with smooth finish gives a contemporary feel to the paved areas of this modern country garden. 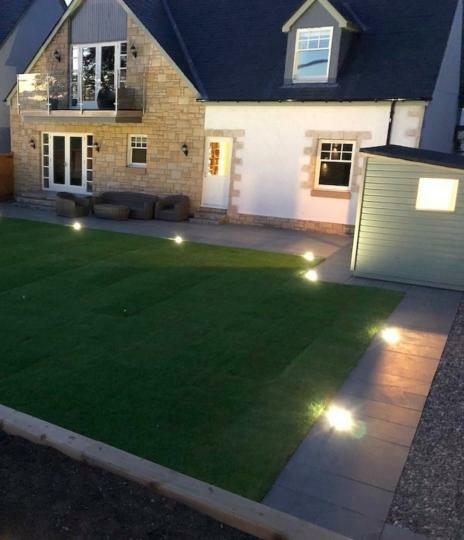 A potting shed and the garden lighting chosen by the client were essential components of the finished space and were incorporated within the complete project-managed package the client desired. In the words of the client several months after completion, "I remain delighted by the reaction of every one who see it - it clearly has real wow-factor and is such a pleasure to spend time in as well as look out at every day."